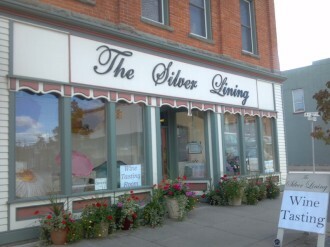 he Silver Lining Boutique is situated in the heart of downtown West Branch inside a restored turn-of-the-century building complete with high tin covered ceilings and Victorian charm. Step back to the past as the historic building embodies the essence of the rich and colorful logging era. Hear the stories of this landmark establishment that has continually operated retail on this location since 1881 and has had only three families as owners. Along with Modern Craft Winery products, the boutique features unique and stylish gifts that include; sterling silver jewelry, purses, journals, and pottery. Our West Branch location is unique because the State of Michigan recently relaxed the rules a bit and began allowing wine tasting rooms under the same roof of an existing business. As far as we know, this is the first arrangement of its kind in the state. The vision and credit for this innovative approach goes to Peter and Sam who are great business associates. Peter and Sam are very active in community events and annual "Wine Walks". The unique downtown location adds to your wine tasting experience. Stroll the streets; take a short walk to beautiful Irons Park, take in a movie or dinner or shop for antiques, books and many other offerings from the accommodating downtown businesses. Enjoy a truly unique wine tasting experience at The Silver Lining. Serving Modern Craft Wines…wines that are unique, simple and loved. Mon - Sat 10 am - 5pm. Closed Sun.